In Mrs. Silva’s and Mr. Chung’s classroom, the children are working on a project that focuses on investigating a local grocery store in their school’s neighborhood. Their project’s guiding question is: “How do people get the food they need in our neighborhood?” In the previous month, the children completed an investigation about a local restaurant. During that investigation, they set up a pretend pizza restaurant in their dramatic play area with the help of their teachers. Pretending to prepare pizza led to many conversations about cooking that children observed at home. The teachers talked with the children about where their families buy food. This led to discussions about the grocery store. the different roles and jobs people carry out in a grocery store. They also think the project will provide rich opportunities to build the children’s language and literacy skills. Below is one lesson Mrs. Silva and Mr. Chung created to help the children recall information from their visit to the grocery store. When the children visited a small neighborhood grocery store, the store manager showed them around and answered the children’s questions about the store and the people who work there. With their teachers’ help and two classroom iPads, the children took digital pictures of the store. Prior to the store visit, the children chose to be in one of two groups: the physical space of the grocery store and the people in the grocery story. The teachers chose these two groups after reviewing the children’s web of questions during their field site visit planning. The first group had many questions about what can be purchased, how items are organized, and how the store is set up. The second group had many questions about who works in the store, what their jobs are, and how they work together. During the visit, the children were able to ask their questions, record observational drawings on clipboards, and take photos with teacher assistance. The children returned from the grocery store eager to talk with each other about their store visit. Mrs. Silva and Mr. Chung organized the photos for the children to review during small group discussions. They decided to print the photos so the children could pass them around. They took notes about what the children said about the photos and the store visit. The teachers used the notes and photos to create a book for the children to review as they constructed a classroom grocery store in the dramatic play area. Mrs. Silva and Mr. Chung each facilitate a small group discussion by holding up the pictures and asking the children to tell them what they see in the pictures. They also prompt the children to share details they see in the photos. As the children talk, they write a running record of the children’s comments. They add these comments to the book pages following the lesson. Mrs. Silva quickly notices that all of the children are excited to share their ideas. She is prepared with the visual cues the teaching team uses in the classroom to help children participate in discussions and understand the agreed upon rules for conversations. Mrs. Silva says to the children, “You are all so excited so share your ideas and memories of our field site visit. We want to be sure we are good listeners to our friends’ ideas and take turns talking.” She shows children the classroom’s “Circle Rules” and says, “Remember we look at the eyes of the person who is sharing their ideas so she knows we are listening to her words. When someone else is talking, we are using our ears to listen to her words.” She then points to turn-taking cards in the middle of the table. “If you have something to say while someone else is talking, you can take a talking card and then I will know you are waiting to say something because I will see a card in your hand. Mrs. Silva and Mr. Chung use the records they created of children’s comments to monitor children’s progress toward meeting the primary benchmark. 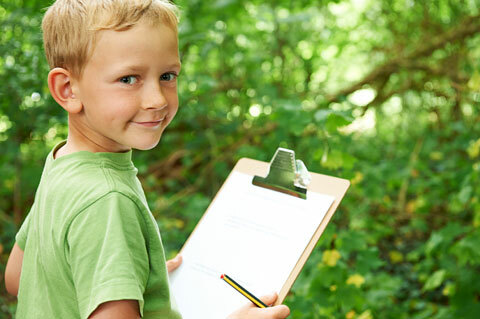 Following the lesson, they each make some short notes about which children were able to recall information about the grocery store field site visit and which children needed teacher prompting to recall information. They include this anecdotal record in the children’s portfolio assessment files. They also make some notes about which children were able to follow the rules for conversation and use the turn-taking cards in the children’s assessment portfolios. Mrs. Silva and Mr. Chung have decided to laminate the book pages and keep these classroom books in the reading area. They plan to encourage the children to take the books out and use them for reference when they are working together to turn the dramatic play area into a grocery store (see adapted lesson plan for 15.D.ECa). This lesson was written in the context of Mrs. Silva and Mr. Chung’s classroom. We now offer some general suggestions of adaptations you can use in your classroom. There are several young 3-year-olds who have less developed language skills. Another child with Down syndrome and an IEP requires additional supports for her cognitive delay. Ask one of the children to choose the next photo they would like to talk about. Help the children find the faces of their friends in the photos to engage them in looking at the photos. Several children speak Spanish, Arabic, and Polish and are learning English. The teachers encourage the children to use their heritage language as well as increase their English vocabulary. They encourage the children to share labels for items in the photos in their heritage language during the small group conversations. As the teachers add children’s words to the classroom books, they ask parents and other school staff for the written words in the children’s heritage languages. In one group, the children also noticed the grocery store had words in Polish, Spanish, and Arabic on the door. The teacher encourages the children to add these signs to the grocery store they will build. Child wears two hearing aids and is receiving speech-only services. Child is positioned directly across from the teacher so he can clearly see which photo the small group is discussing and be able to best hear the conversation. A speech language pathologist also adjusts the child’s hearing aids as needed. Child has a diagnosis of autism. He has advanced verbal skills but has trouble staying on task for even brief periods of time. During the small group conversation, the teacher seats him next to her so she can easily pat his back or hand him a turn-taking card when he interrupts other children’s ideas. To keep the child on task when other children are talking, the teacher prompts him with “Circle Rules” cue card pictures to remind him to make eye contact with the speaker and listen quietly. 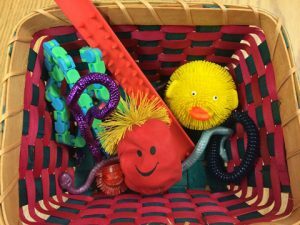 She also keeps a basket of “fidget toys”—squishy balls, koosh balls, and other small toys that she hands to children who are having trouble sitting still and/or focusing on the conversation.